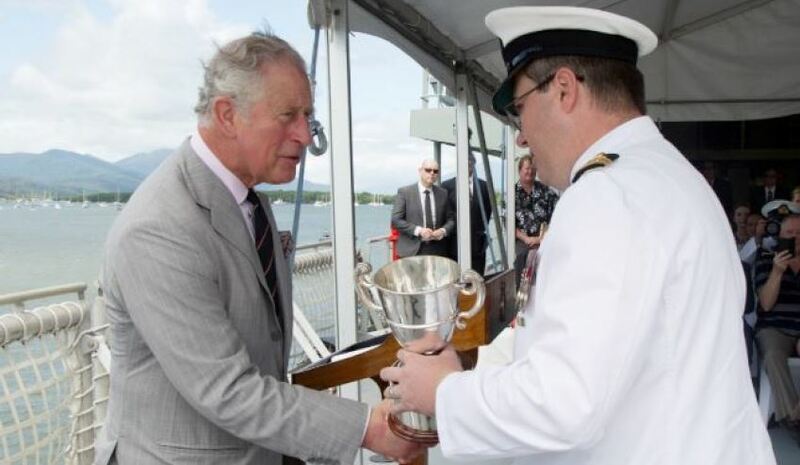 ommanding Officer HS Blue Crew, Lieutenant Commander Dean Battilana accepts the Duke of Gloucester Cup from His Royal Highness, The Prince of Wales at a ceremony onboard HMAS Leeuwin. Image via the Royal Australian Navy. While visiting Australia for the Commonwealth Games, His Royal Highness Prince Charles travelled to Cairns to meet with ADF personnel and present the Duke of Gloucester’s Cup. While onboard HMAS Leeuwin, Prince Charles awarded the cup to the crew of Hydrographic Ship (HS) Blue Crew for its outstanding work in 2017. The Duke of Gloucester’s Cup is awarded annually to the Royal Australian Navy unit that has demonstrated the highest level of overall proficiency in the previous year, and is customarily presented by the Governor-General. Commander Australian Fleet Rear Admiral Jonathan Mead said the perpetual trophy recognises exemplary performance. "The Duke of Gloucester’s Cup has a rich, 71-year history as the highest annual award for outstanding service to the Royal Australian Navy," RADM Mead said. "HS Blue Crew has succeeded in all respects in 2017 and can be justifiably proud of their achievements and for being the first hydrographic unit to win this prestigious award." HS Blue Crew was awarded the prize for consistent high performance in her core operational and hydrographic mission, successful integration into Exercise TALISMAN SABRE 17 and the rapid and effective support to an allied partner during the search and subsequent recovery operations of a downed military aircraft. Blue Crew’s Commanding Officer, Lieutenant Commander Dean Battilana, said winning the Duke of Gloucester’s Cup capped off a busy and successful year for the ship’s company. "We are honoured to be rewarded for our efforts and to receive the Duke of Gloucester’s Cup from His Royal Highness makes it even more special," LCDR Battilana said. "Blue Crew has delivered on everything that I and higher command has asked and more. This award is a testament to the ship’s company’s knowledge, skills and dedication to duty."